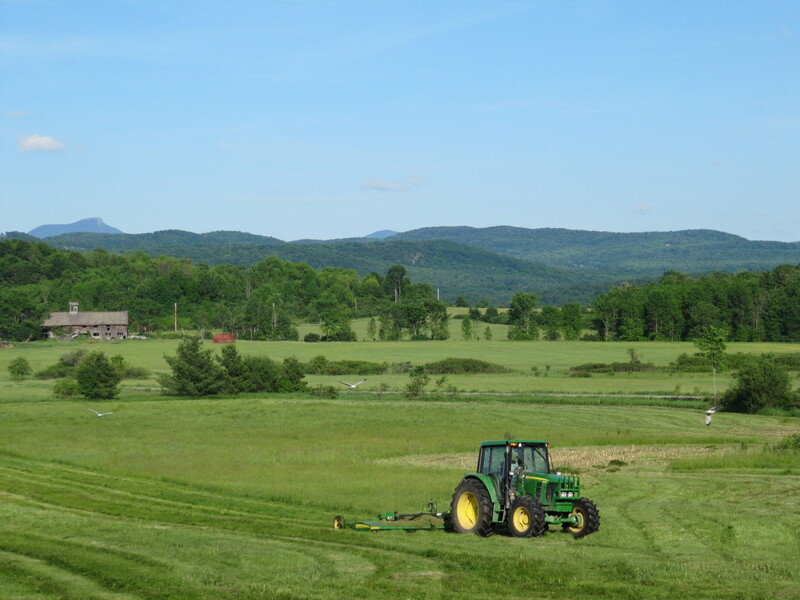 I finally finished mowing our field today. 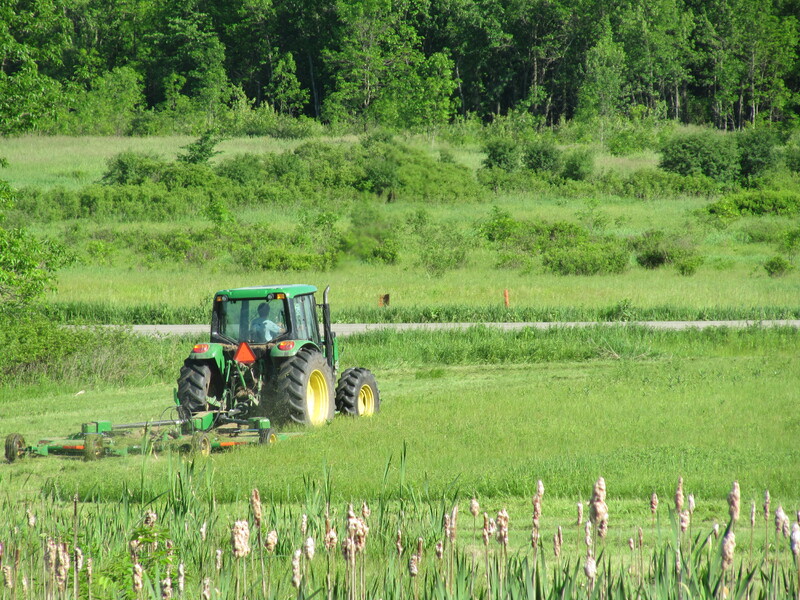 We have a new set-up to make this happen–a John Deere Gator and a DR tow-behind brush hog. It worked remarkably well. Once we had all the parts and added oil and gas and started things up, I hit the field and got cutting. But I was stymied more than once. In the past we have postponed our mowing due to the weather. The field was too wet or it rained when we had the time to cut. Or we didn’t have a tractor with a brush hog when we needed it. We were hoping this would take care of at least the latter issue. And it did, sort of. I started near the end of July. This was perfect. We needed to wait until at least mid-July so that any birds nesting in the field would have fledged. Bobolinks and red-winged blackbirds are ground nesters and we wanted to make sure they didn’t get chopped up in the blades. That is just bad juju. Also, part of the reason we are cutting all this vegetation is the wild parsnip–the stuff has taken over and we wanted to cut it down before it went to seed. That started off well. Then I had a problem. I got stuck in reverse. I couldn’t get it into drive again. I shook the rig and wiggled everything around and eventually it went into gear. But then it happened again. So we called the dealer and they hauled it away to be fixed. Then, of course, we went away for a week. Two weeks after I started mowing I recommenced. I made some progress but much of the wild parsnip had gone to seed. I needed to get it done. And then, unbelievably, it got stuck in reverse again. Same problem–not fixed after a new shift cable was installed. They took it back and were not happy about it, but fixed it again–bent stick shift this time. They were patient, as were we, and soon the machine was back. Today I got back in the saddle and everything went smoothly. I finished mowing just in time to zip out to pick up my daughter from day camp. The wild parsnip had almost totally gone to seed–it was brown and dry and sometimes the seeds scattered as I hit the plants. Not good. But those seeds would have scattered at some point anyway. I needed to cut it now and then cut it again later. The key to keeping this stuff down will be (hopefully) to just cut it again and again until it has nothing left to keep growing. It could take a while–maybe years. The good news, however, is that I also was cutting purple loosestrife, another invasive that has been super aggressive in our field. That had not yet gone to seed, so it should be less work to keep that back. I may cut one more time this fall. That could mean we get more grass than other, more woody, plants come spring. That is good for the bobolinks. They don’t nest in our field much because it has less grass than surrounding fields. Maybe the birds will take a liking to our space and settle down to raise some chicks next year. If I don’t get to it, so be it. I at least will cut again next July and keep those invasives at bay. Unless I have trouble shifting again. But I will worry about that if it happens. For now I can be satisfied that one summer project is finally complete. My son and I took a walk this afternoon to see if we could spot any interesting critters, like we did yesterday. No dice. Too sunny and too hot. The critters were all holed up. 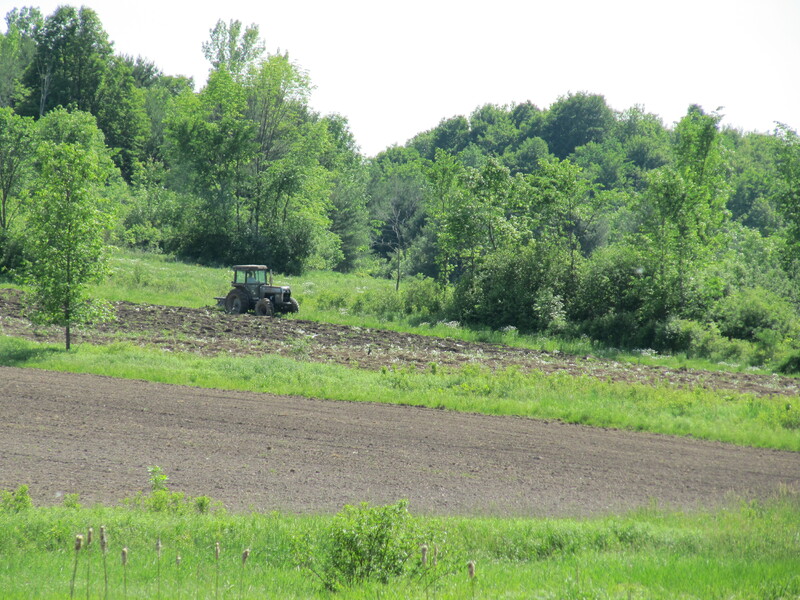 We did, however, see a neighbor plowing his fields, ready to plant corn. Then another neighbor came by to ask if he could cut our field. He wants to cut it for hay but it needs some work before that can happen. There isn’t much grass but there is a lot of other plant life. I took a walk while he went to get his tractor to see if there were any ground nests. My hesitation with cutting the field this early is nesting bobolinks. 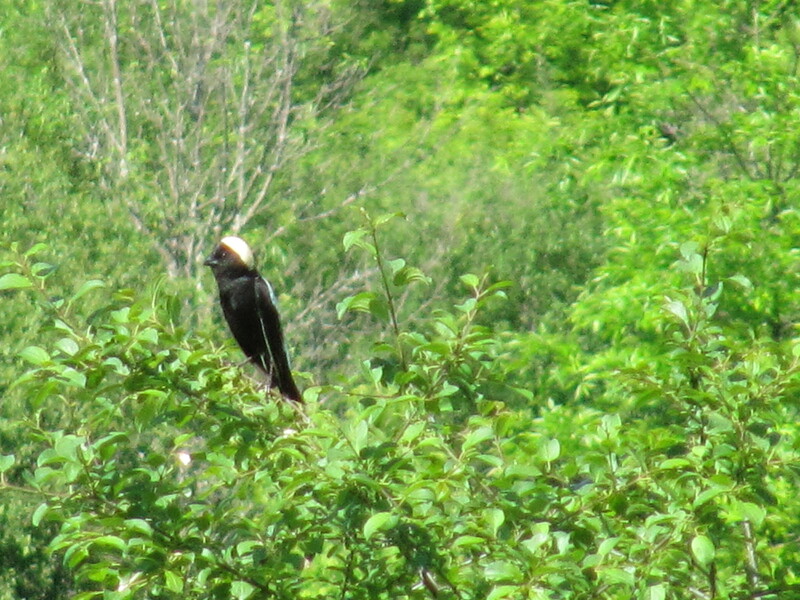 They seem to like the adjacent fields better than ours, however, and we are clear of bobolink nests for the time being. I did see a couple of the warbling birds just beyond our field but none were hanging out in ours. So he mowed. With the big honking tractor, unlike the one we used ourselves to mow in the past, the one that now seems what one might call wee, it took less than two hours. It took us eight to ten hours with the smaller tractor. He got the job done before we knew it, waved and headed back up the road. The gulls had a time with it, picking up the mice that tried to run away. Poor mice. This is the first of perhaps three cuts for the summer. Eventually, we hope, grass will outcompete the “weeds” and will fill in the meadow. Then, bail it and feed it to the cows over the hill. It looks all right, and it smells great. And I can’t say I will miss the wild parsnip that was starting to get way too tall. 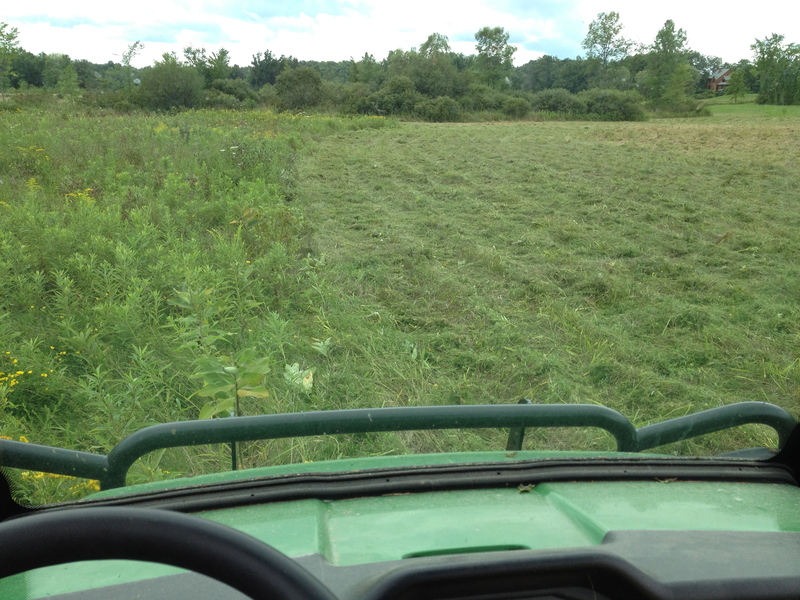 That stuff is trouble, and I am happy to see the fat stems of that invasive plant get chopped. Let’s see some timothy take its place. That will feed some animals. Even better than the mice fed the gulls. Like I said, poor mice. We are looking to get frost again tonight. The children and I went out to cover the pumpkins seedlings, plus one cucumber plant that has just busted though the soil. It was too windy for the plastic buckets we used before–no way they would stay on all night. We improvised. The kids’ orange play cones did the trick. They are a little heavier and more stable. Hopefully they will protect our little guys. We may not get a frost but why take chances? Notice the grass clippings on the bed. I edged the beds with our electric trimmer this afternoon. I had to use two extension cords to get that far, but it worked like a charm, I mean, except for the grass clippings everywhere. It worked so well I trimmed all over the place, even under the apple tree up on the hill. And around the blueberry bushes. I will do that again. So the pumpkins have trimmed beds to sleep in. A bit messy, but with those cozy cones to keep them warm, my guess it they won’t notice.